The much anticipated Precision Trolling Data, iPhone app was released in October of 2013. Hundreds of anglers have already signed on and are enjoying Dive Curve data for 182 different lures and trolling devices on either their iPhone, iPod or iPad device. Anglers who purchase the app data can use it at no additional cost on any or all of these approved personal devices. The 182 lures and devices featured in Version 1 represent the best of the best in crankbait brands and models plus a host of new lures never before published. Version 1 of the PTD iPhone app also features popular trolling devices like Off Shore Tackle Tadpole Divers and the Bass Pro Shops Keel Sinkers. An Android version that features the same data and options is under construction and will be available soon. 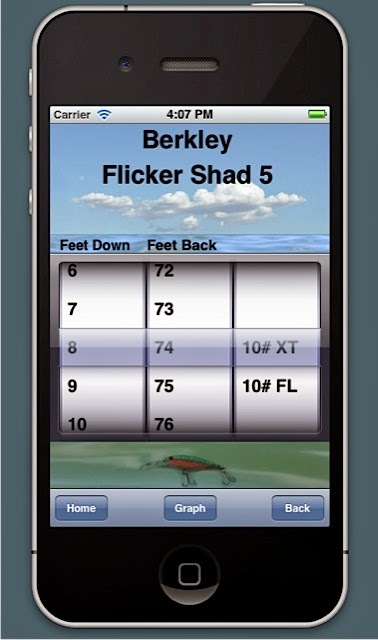 Both these app options allow anglers one free sample Dive Curve and also an opportunity to check out the new “Depth Wheel” function that essentially allows an angler to pick a target depth and the app will indicate the lead length needed to achieve that depth. The same “Depth Wheel” allows the angler to pick a lead length and the app spits out the target depth a lure will reach on that particular lead. The Depth Wheel was designed to spit out fast and accurate trolling data, without having to scrutinize the normal Dive Curve graph featured with each lure and trolling device. Additional Precision Trolling Data information can be purchased in a variety of ways. 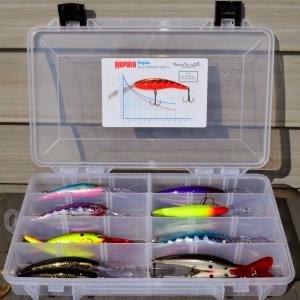 Each of the 182 lures and trolling devices featured in the app can be purchased individually for $1.99 each. The complete set of 182 Dive Curves offered in Version 1 can also be purchased for $49.99 or anglers can purchase the Lifetime Version for $99.99 which includes all the lures in Version 1 and as new data (Version 2, Version 3, etc.) is added to the app no additional fees will be charged for the life of the app. The same purchase options and pricing will apply when the Android version is made available. When new data is added and Version 2 is released, Lifetime members will receive this information at no additional cost. The cost of Version 2 has not been determined as yet and will be based on how much information this version contains. The cost of Lifetime memberships will go up slightly with the introduction of each Version as more information will be included in this option. If a Precision Trolling Data customer loses or purchases a new phone, data they have purchased can transferred to the new phone at additional cost to the customer. Customers who purchase an iPhone version and then switch to an Android version will have to purchase both versions as they function using different operating systems. HOW OFTEN WILL VERSIONS BE RELEASED? Complete versions will be introduced approximately once or twice a year. However, as important new lures are tested, many of these will be released as individual lure purchase options and made available to Lifetime Members at no cost. The reason for this, is to make important data available as fast as possible and also to reward Lifetime Members for investing in this option. WHAT WILL BE INCLUDED IN NEW VERSIONS? New versions will feature popular crankbaits, including the latest baits from Rapala, Storm, Reef Runner, Matzuo, Salmo, Berkley and many other brands. In addition, new versions will offer more speed and line options for popular devices like the Tadpole Divers, BPS Keel Sinkers and Off Shore Tackle Pro Weight System. Future versions of Precision Trolling Data will also start sharing important pieces of data from the “Big Water Edition” including devices like the Luhr Jensen Jet Diver, Lurk Rundown Diver, Big Jon Mini-Disks, Luhr Jensen Dipsy Divers and many other divers and diving planers. In addition, PTD has done extensive testing on Dacron, Microdyneema and Spectra fiber based brands of lead core fishing line. These lead core products vary greatly in diameter and depth data will be provided on the most common sizes including 12, 15, 18 and 27 pound test versions. All of these lead core products have been tested in segments ranging in length from one color to 10 colors and at various speed ranges. Also included in future versions will be copper line data for 30 and 45 pound test copper line products including the most popular lengths of copper line. Future Dive Curves for PTD apps will also include specific combinations of popular trolling products, like combining lead core line and diving crankbaits, Tadpole Divers and lead core line and other creative combinations that promise to explore uncharted waters. Many anglers still cry out for the printed Precision Trolling books that have become so popular. No more books will be printed, but the same information contained in previous books and in our current and future apps is available as Precision Trolling Data Stickers. These stickers are essentially the Dive Curves anglers have come to love printed onto waterproof vinyl similar to bumper stickers. Just peel and stick the Dive Curve Sticker to the inside lid of your 3700 style tackle storage boxes and the data will always be handy. Precision Trolling Data Stickers can be purchased individually for $1.99 each on line at www.precisiontrollingdata.com or packages of stickers organized by brand and lure type are sold at popular retail outlets.